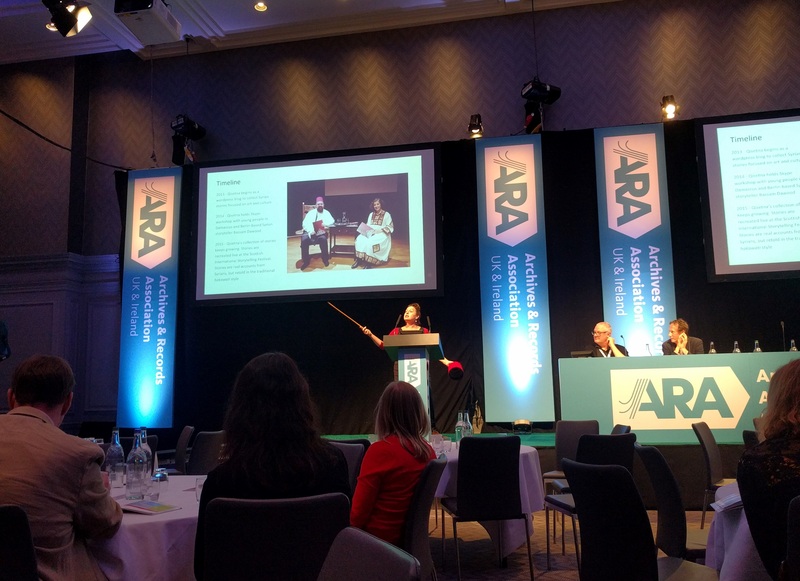 Our cataloguing archivist Rachael attended the large Archives and Records Association conference in Glasgow this August. Find out what she learned in this article, re-blogged from the Archives and Records Association magazine. This summer I was lucky enough to receive a bursary to attend my first Archives and Records Association Conference in my home of Glasgow. The theme of the conference: ‘People Make Records’ echoed the City’s moto: ‘People Make Glasgow’ and this slogan was a great platform for some very important themes and discussions throughout the three days of papers. As I perused the programme in the days leading up to the conference, I was looking forward to the great variety of discussions about topics such as volunteers, community archives, digital preservation, and building audiences. The experience did not disappoint with records professionals from around the world sharing their research and experiences while providing food for thought. 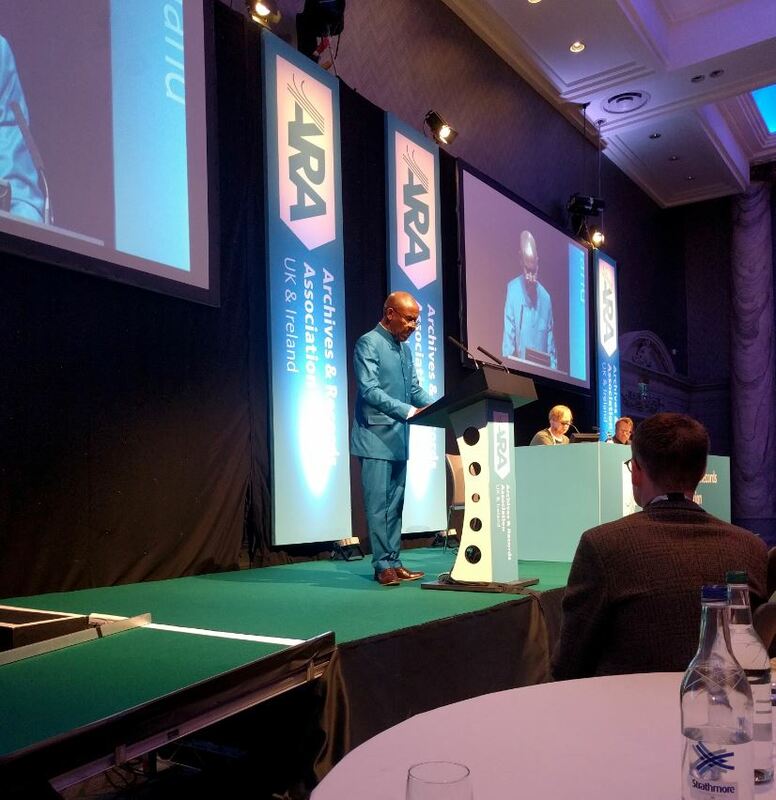 The conference opened with a powerful Keynote speech by Professor Gus John: writer, education and social campaigner, researcher and lecturer who described the need for archivists to actively combat social and racial injustice in the recording of history. Professor John’s accurate and necessarily uncomfortable assessment of white, Eurocentric privilege seen in systems such as Education and the records keeping profession was a call to arms to redress the balance by giving under-represented community histories the attention they deserve and enabling those from disenfranchised backgrounds to study information management. The first session I attended followed this theme with speakers discussing representation and the need for strong collaboration between communities and archivists to uncover and share diverse stories. I was struck by how the preservation and sharing of community stories can feed back into a community identity and empower its members. These opening sessions set the tone for the rest of the conference with themes of inclusivity and diversity explored throughout. In the face of the message to our profession to combat endemic and historic social and racial injustice, I was initially guilty of feeling too small to attempt anything as large scale and important. In the course of the conference, however, I realised that is it this feeling of impotence and consequent inaction that maintains the status quo, and that if enough of the profession shares the stories of disenfranchised groups from within their records, and diversifies the workforce, we can break the cycle of history repeating itself (to use the apt metaphor of the second Keynote speaker Michelle Caswell, Professor of Archival Studies at the University of California Los Angeles). The preservation of digitised and born-digital records is a rapidly growing concern for the record keeping profession and was another theme that particularly caught my attention. Until this conference most presentations on the subject I had attended focussed on defining the theoretical ‘problems’ of digital files and the ways in which the task of preserving them is a thorny and gargantuan one. Unsurprisingly, this has led to many archivists, including myself, being daunted when dealing with the ingest, cataloguing, and processing of digital files, however the papers in this conference were much more positive in tone and offered some brilliant case studies. A number of repositories sharing their own digital preservation practice was helpful in bringing this hugely important field out of the realm of theory and into the reality of information management. The stimulating ‘Digital Skills’ session on the last day enabled discussion between the panel members and the entire audience about the skills archivists require to deal with the growing mass of digital records. This debate cemented my instinct that the traditional skills of assessment, appraisal, description, providing context and ensuring authenticity used when managing analogue records are every bit as important now as they ever have been. The skills required to ensure that a truthful and representative record of history is preserved for future generations do not change, even if the formats of the records do. The conference provided excellent discussion of important concerns in the information management sector in new and interesting ways including panel discussions, debates, workshops, and posters and as well as grappling with serious professional issues, it was great fun! 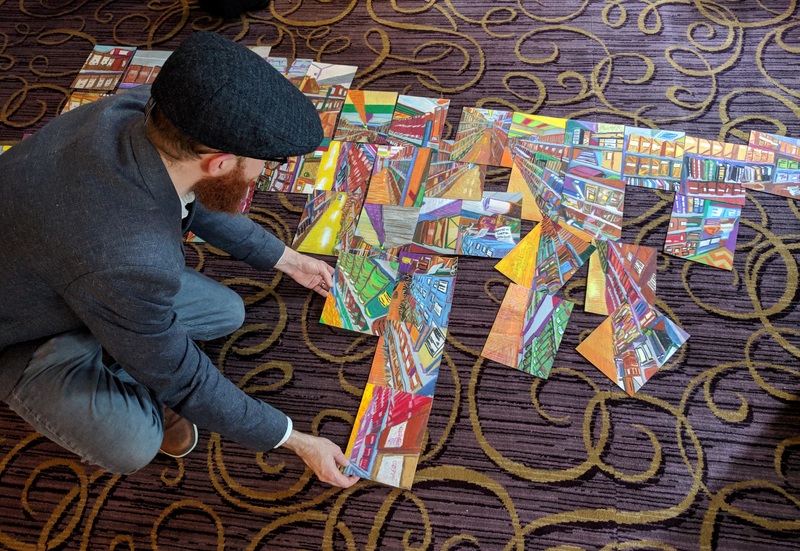 I had a fascinating conversation with the conference ‘Artist Archivist’, Peter Morphew, who is inspired by the contents of archives and their processing to create colourful and energetic works of art. The social events were a great opportunity to meet fellow information professionals, and to dance with a few of them at the Ceilidh following the Gala Dinner! I also cannot end this round-up of a great conference without mentioning the ice-cream that delegates could claim during a break on the Thursday, including, in true Scottish style, Irn Bru flavour! Thank you again to the ARA for the bursary enabling me to attend this punchy and thought-provoking conference. It has been fantastic learning from fellow professionals but for me the hard work starts now as I strive to put the messages of diversity, inclusivity, and digital preservation into practice during my career as an archivist.